We've Deprived Them Of Their Liberty. It's Time To Show Them Some Humanity. After four long years, ending the deal is the right thing to do. "All they want -- all they have ever wanted -- is a chance at life in safety and freedom." This week marks four years since then-Prime Minister Kevin Rudd announced that no person seeking asylum by boat would ever be allowed to stay in Australia. Instead, people fleeing persecution would be warehoused indefinitely on the remote Pacific islands of Manus and Nauru. Four years later, 2000 innocent people -- including 169 children -- remain trapped in a painful limbo. I've travelled to Manus three times since Rudd's announcement. Each time I have seen first hand what is, and what always has been, a dead-end arrangement destined to produce nothing but misery and human suffering. My first trip was back in March 2014, just after Reza Barati was murdered. Conditions were appalling. There were guards everywhere. The facility was shockingly overcrowded. But the thing I'll never forget was the fear and exhaustion on the faces of the men being detained there. They'd point out the bullet holes, show me their injuries and describe their fears. But what caused them the most anguish was the uncertainty. Would they be there a month? A year? Forever? They had no idea if or when they'd ever get a chance at life in freedom and safety. No idea if or when they would ever see their families again. One of the men described the uncertainty as being like 'mental torture'. Yet four years later, his torture continues. It is absolutely inexcusable that they remain in limbo, especially with all the shootings and the violence and suffering and the deaths that have happened in the interim. I've been back twice since then and have come to know some of the truly extraordinary, resilient and bravely defiant people our government continues to torment. People like Farhad, whose incredible paintings and poetry have featured at exhibitions in Melbourne and Canberra. People like Imran, who didn't speak a word of English when sent to Manus, but who has now written a book and published opinion articles in Australian media. People like Behrouz, a journalist who bravely recorded an entire documentary from inside the detention centre on a mobile phone -- a film which recently screened at the Sydney Film Festival. For four years these innocent men have been told what to eat, where to sleep and when they are allowed to use the phone. They have been deprived of their liberty, deprived of their autonomy and deprived of their most basic rights. But they refuse to be deprived of their humanity. There have been a few fleeting moments of hope and optimism, but time and time again those hopes have been deliberately crushed. When the PNG Supreme Court held that their indefinite detention was illegal, the ruling was circumvented by just flinging the gates open and leaving the men stranded on the same island. When the United Nations found that their treatment breached basic human rights standards, our government merely thumbed its nose. 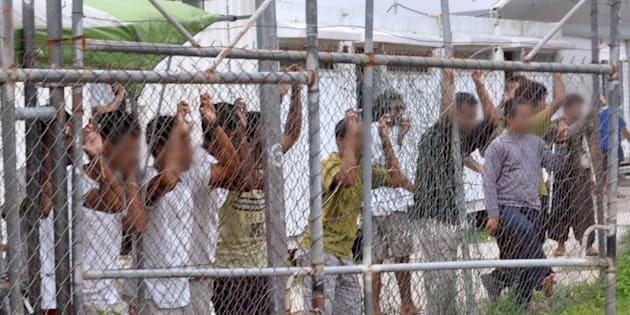 When PNG announced that the facility had to close, our government begrudgingly agreed to bulldoze the place by 31 October but has refused to find anywhere safe for the men trapped inside it to go, leaving them more afraid and at risk than ever before. Why Are We Making It So Hard To Call Australia Home? Then, there's Malcolm Turnbull's US deal. The deal initially gave the men some hope -- finally our government was conceding it couldn't just abandon them there forever. But it's now eight months since the deal was announced and not a single refugee has been resettled. Most of the men on Manus haven't even had an initial interview. Then came the news last week that the US government had filled its quota of refugees for this year and that US officials had walked off the job on Nauru. It's no secret that Trump hates the deal. It's looking shakier by the day. The bottom line is that no one is likely to go to the US anytime soon and many now seem unlikely to ever go at all. 2000 lives remain on a painful pause with no end in sight. 169 childhoods are being spent surrounded by suffering and despair. After four years, enough is well and truly enough. Yes, Rudd had some political challenges when he announced the deal, and yes, Turnbull will surely face some if he tries to end it. But ending it is the right thing to do. Whatever the question, deliberately destroying the lives of innocent people is not the answer. Every single person being warehoused on Manus and Nauru must immediately be evacuated to safety. All they want -- all they have ever wanted -- is a chance at life in safety and freedom. They've had four years of their life taken from them. They surely deserve a future.